As I look out my window this morning, I actually see some sun and a little blue sky! It's notable after the past few days that saw the remnants of Tropical Storm Lee dump 15 inches of rain on Elizabethtown and the surrounding area. That caused lots of problems, including flooded streets, some people's evacuating homes on Poplar Street, manholes that bubbled up with excess water and basements with a little to a lot of water. And I think these issues might just scratch the surface. 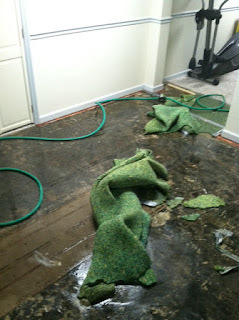 Personally, my house had water in the finished basement that required tearing out carpet and the padding (see the picture at left). I still have three fans and a dehumidifier running constantly. I talked to the previous owner of the house, who was surprised because he grew up here and raised his own family in these walls and never had water in the basement in 50 years. That includes Hurricane Agnes in June 1972 that devastated parts of Central Pennsylvania, including Harrisburg. Clearly, the storm this week was an extraordinary event. So when I talked to someone at the borough office yesterday afternoon, he mentioned that people called to report problems with sewer backing up into their basements. And they blamed the borough, or they blamed neighbors. As the borough said in its news release yesterday, those problems are not the borough's responsibility. Besides, when your community gets 15 inches of rain in a few days -- in a month when the average rainfall is typically less than 1 inch -- all bets off in my opinion. From the perspective of this borough councilman, this isn't a time to pit neighbor against neighbor and play a blame game. This should be a time for us as a community to come together and help each other. Kudos go to the borough staff, the Elizabethtown Police Department, the Elizabethtown Fire Department and emergency management for an outstanding response. As my fellow Councilman Meade Bierly said, it makes our jobs as elected officials easier.